Colorfull Biellmann ice skating pants featuring Polartec power stretch fabric, that provide warmth and give freedom of movements. Colorful design contain 400 pieces (clear, aqua and red)superior quality crystals. All rhinestones have rainbow coating that bring more shine! 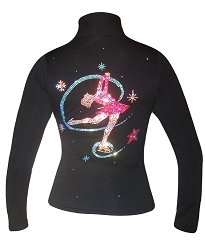 Snowflakes, star and sprinkles of rhinestones create beautiful frame for one of the most desirable elements in figure skating - biellmann spin.